In Kirigakure no Sato, Hidden Village of Mizu no Kuni, there are Seven legendary swords capable of great power. The swords have specific requirements listed in their description. While not all swords are currently inside Kirigakure no Sato, they were all Created inside of it. Some of the swords have been given away as a form of Peace Treaty. The swords, their descriptions and powers, as well as their requirements, are listed below. Description: Six feet long and eighteen inches wide, Kubikiribōchō is a massive weapon capable of devastating amounts of destruction. It is unique in that it is capable of harvesting the iron in the blood of its victims, utilizing this to reform the weapon when it suffers damage. This repairation is almost instantaneous, able to completely restore the blade within just a few attacks. As long as any of the weapon remains, it is capable of fully reforming itself. Additionally, due to its ability to restore itself, the user can also feed their own blood to the weapon to restore it at will, draining only their blood and no chakra. Description: Described as the most terrifying of the seven swords, Samehada is seven feet long and two feet wide when completely sealed, making it by far the largest. The blade is made of scales, causing it to inflict injuries through shredding or shaving what it comes into contact with rather than just cutting the object in question. While it ordinarily remains rigid, Sameahda's hilt is able to stretch and bend to great extent, allowing the weapon to be used like a flail. Its greatest ability, however, is its ability to feast on chakra. 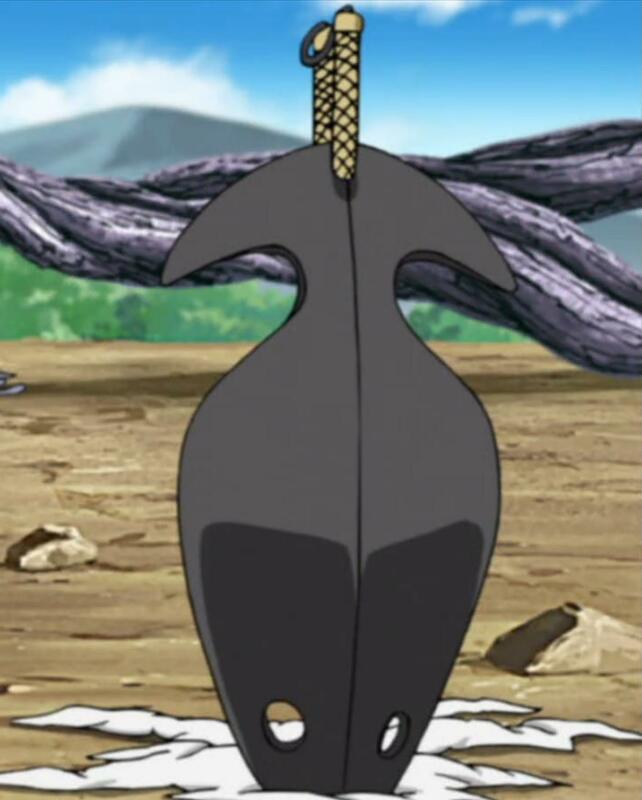 The user is capable of feeding 10 chakra per post into the weapon, which "activates" it, extending the scales into spikes. As Samehada absorbs more chakra, up to a total of 100 points, it slowly becomes much larger and even obtains a mouth, resmebling a shark completely. At maximum chakra, the weapon is ten feet long and two feet wide at the thinnest point, while four feet wide at the edge. If Samehada makes contact with another living creature while activated, it will absorb the chakra from them instead of the user, causing the weapon to have no upkeep for that post. Once per thread, the user can instantly seal Samehada to its original state, absorbing all of the chakra stored within it. Description: Greatly resembles a large needle, with a long length of thin wire-mirroring thread, tied through the eye located at the base of its hilt. This sword is said to possess the ability to pierce all and stitch them together, demonstrated through its ability to effortlessly penetrate multiple targets in a single thrust and then quite literally stitched them together in substantial bundles, by simply pulling the attached wire taut. A capable user can even throw the sword with the intent of piercing a line of multiple enemies, before catching the needle at the other side and repeating the process at different angles, in order to create knots of corpses with the wire passing through the entirety, effectively creating bundles of bodies at various points along the length of the thread. Comes with a minimum of 200m of Ninja Wire sealed into the users palms, able to be unsealed and used at will with no cost. Description: The sword itself consists of a giant axe and hammer, linked end-to-end by a flat thin leather-like rope, that is said to be able to break through any defence. Although the length of cord means each weapon can be utilised individually, to cut and crush obstructions respectively, their true strength lies in their capability to be employed in conjunction with one another. When facing a particularly difficult or seemingly impenetrable defence; the wielder can first attack by striking with the axe, before slamming the hammer downwards onto its blunt backside, thus using the blade like a wedge to drive straight through the offending obstacle and into the desired target located behind. The user of this sword receives the Physical Affinity [Tier IV] Strength at 1/2 Upkeep cost. Description: The blade utilises various explosive tags, contained within a substantial scroll, in order to incorporate explosions into the user's own swordsmanship, earning it the title of "blast sword". The sword itself features two distinct sides, with a narrow cutting edge located down the entirety of one length and a wide platform section on the other. The aforementioned scroll unrolls along this latter side, sliding downwards and resting atop its surface to form an individual segment comprised from 12 explosive tags, which separates from the remainder upon detonation. Only once the desired opponent comes into contact with the platform, do the explosive tags finally ignite and then detach, providing a small opportunity for the user to escape the devastating blast radius, while simultaneously compensating for any resultant recoil. The sword is seemingly able to reload another segment of tags onto the platform, automatically after each strike. This sword drains no chakra to activate the explosive tags, instead relying on ambient chakra. 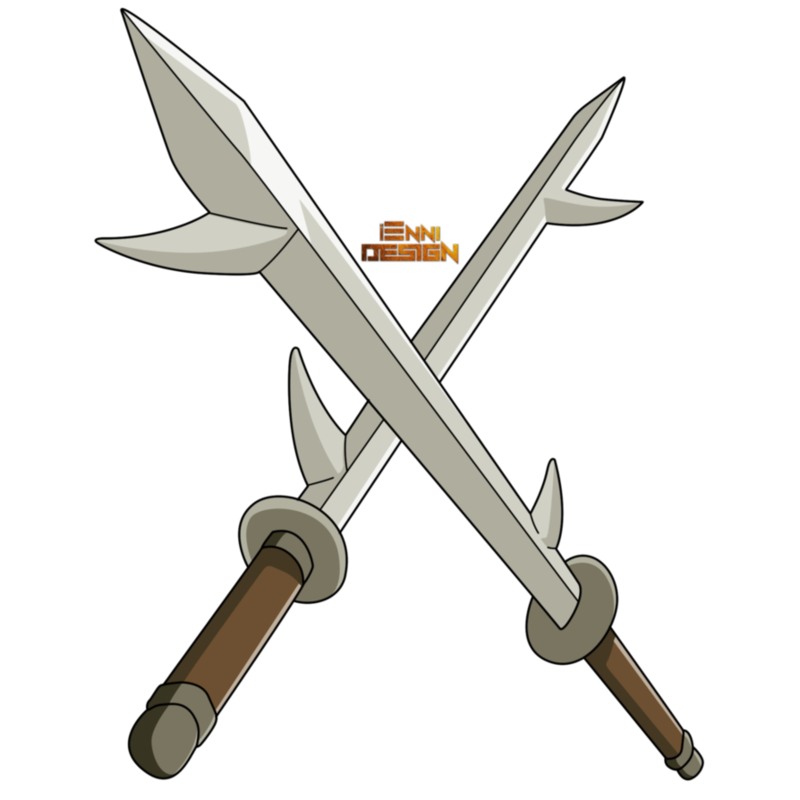 Description: Twin swords, each have been imbued with lightning, displaying enhanced cutting power in a manner similar to the high-frequency vibrations of lightning-based chakra flow. It is this capability that has resulted in these swords being claimed as the sharpest swords in existence. They allow the user to transform and manipulate lightning freely. They also boost the user's attack power to the highest limit, which allows them to perform high-level Lightning Release techniques with a minimal cost of chakra. These blades can channel the user's own respective lightning techniques or conduct natural lightning. As long as there is natural lighting to access, the user can battle continuously without tiring and launch lightning from the sky to strike anywhere within a large area. They can also be connected at the hilts to form a larger double-bladed sword. They are able to perform various long-distance, powerful, and defensive techniques, either lightning-based or imbued with it. Even without lightning, they are very dangerous in battle, able to be used in combination with agile spinning movements, sweeping through the targets while the user also rotates. In specific terms, these swords lower the cost of Raiton jutsu by 3 at C-Rank, 6 at B-Rank, 10 at A-Rank, and 15 at S-Rank. Description: Hiramekarei is capable of storing chakra. With the command "Hiramekarei Unleashing" the stored chakra is emitted from the holes at the tip of the blade. The chakra rapidly coats the sword and can be shaped into various weapons, such as a hammer or a long-sword. The more chakra that is stored in Hiramekarei, the larger the size of the manifested weapon. This discharge of chakra causes the bandages it is typically wrapped with to unravel. It can also create a large amount of light blue, fish bone like-crystals that can inflict great damage and restrain the target's movements. Hiramekarei can also split into two swords, each with a single handle. The wielder of this weapon unlocks the jutsu listed below. Description: This jutsu requires no handseals, except for shouting the name of the technique, and currently holding Hiramekarei. At use, this jutsu coats the weapon in chakra, allowing them to form any other weapon they can think of from chakra, with the base of it being Hiramekarei. 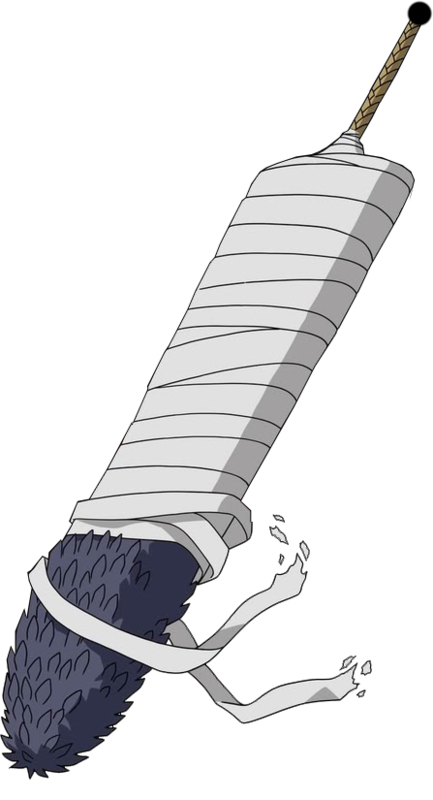 If used at A-Rank, this jutsu will result in a weapon roughly the same size as Hiramekarei itself; if used at S-Rank, this jutsu will result in a weapon up to 4x the size of Hiramekarei, at the user's discretion. The actual attack power of the weapon formed is entirely based on the power of the user swinging this weapon, and the weapon formed will last for one post; finally, the weapon can be changed at will during that post.